Buzzy Bee provides upper elementary and middle school students with an ideal opportunity to hit the high notes as they explore properties of sound. Using simple materials, pairs of students build a sound-generating model that they use to investigate the relationship between vibration and sound production as well as energy transformation. 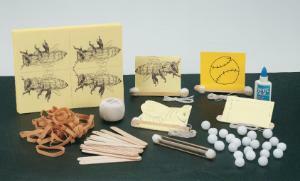 Buzzy Bee opens up a cross-curriculum approach to sound that easily ties into music and art curricula. Teachers guide, student procedure and journal page are also included. Grades 4-8.